Today we're hearing from Jonathan D. Lopez, a Grand Rapids-based artist who won an Artist Seed Grant to bring "Close to Family," to ArtPrize Nine. Read on to learn more about this project, what inspires him, and more. "Close to Family" is a comical look at tiny house living in downtown Grand Rapids -- more specifically in a five by twelve inch post office box. 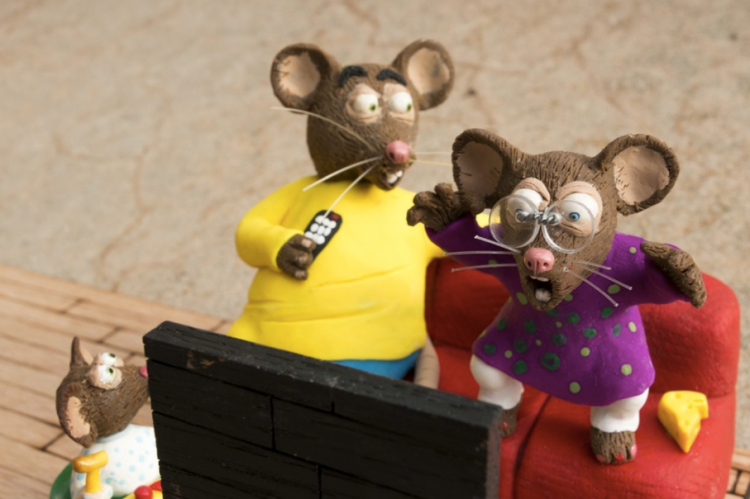 Viewers will be able to look into the chaotic living room of a multi-generational, mouse family. Almost all of my work has been created with modeling clay, melted down and reused again. While the style of characters are the same, I've been experimenting with polymer clay and laser cutting to create this miniature scene. Most recently, I've been inspired a lot by Christoph Niemann, a German illustrator. I love how informally he creates work with the mundane objects of the day and transforms them into something completely unexpected. Additionally, his work is incredibly humorous, and I just can't get enough of comical art. I have always been interested in animals, so it wasn't a far stretch to satirize the ridiculous behavior of people with typical behavior of animals. Luckily for me, there isn't a shortage of new documentaries on animals and there seems to be new trends every day. I hope to get the chance to illustrate a children's book that would influence the generation of my niece and nephew. I was inundated with illustrated books as a kid, and I want to create work that revolves around tactile media that they can pick up at a craft store and start using at a young age.